Palm Sunday was our twenty-third wedding anniversary. Hubby agreed it was time for a new gas grill finally yeah! I have wanted a new gas grill for a number of years now. We decided were not going to go all out on the thing, nothing too fancy, a nice size standard gas grill and a steak dinner. Yeah right. Red n Red, 4 hours & 3 trips later! Got the grill home hubby was impressed, too bad because it did not light. After a conversation with the store, I found out the ignition switch was bad. Back to the store to swap the part, ok it is not too late for steaks yet. Install the thing only to find, no flame again! In order to shorten this four-hour long, aggravating story, the manager gave us a free upgrade to the tune of $200.00 and wished us a happy anniversary. Yes, we spent over our limit but received double the grill, with InfaRED technology, woo hoo!! From start to finish, the whole grill ordeal took four hours, however our anniversary steaks were great. 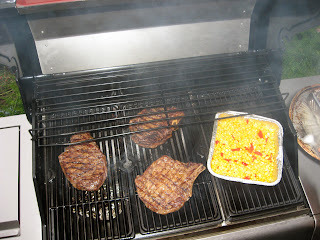 My first, (fast) grilled rib eye steaks, fiesta lime corn, and a big fresh garden salad yippee! Prepare a foil packet of hickory chips for the double burner side. Toss that in the grill while preheating. Season the steaks with Grill Mates Mesquite seasoning, smoked paprika, and a splash of ground Chipotle pepper, rub, and let rest for 15-20 minutes. Meanwhile, mix corn with pimentos, 2 tbsp butter, a sprinkle of Adobo, and a squeeze of a lime. Put the corn in a foil pan and onto the medium heat side. After the grill was hot, threw the steaks on, rotated each twice during the first five minutes, turned and continued to cook for two minutes more. Outcome, delicious steaks PDQ with a light smoky flavor; the best smoky fiesta corn I have tasted in quite some time. I am still excited and cannot wait to grill some vegetables, chicken, fajitas, pork… well probably everything will be grilled for a while, thank you dear hubby! 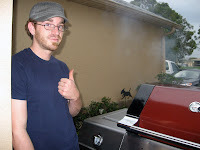 Have a favorite grill tip for me, 'cause I could sure use some experienced insight?